On Wednesday 3rd October I attended a twilight session on mastery in mathematics delivered by David Benson (senior lecturer in mathematics). The aim of the session was to share a common view of what mastery in maths looks like and to help develop a shared understanding and approach. The session was a real eye opener and I am not sure I can convey in words how inspiring I found it. The big question is what does maths mastery look like? Maths mastery is a concept that has been around for a number of years now, but when we talk about it what do we mean? The idea of teaching maths using a mastery approach means that everybody can master mathematics. 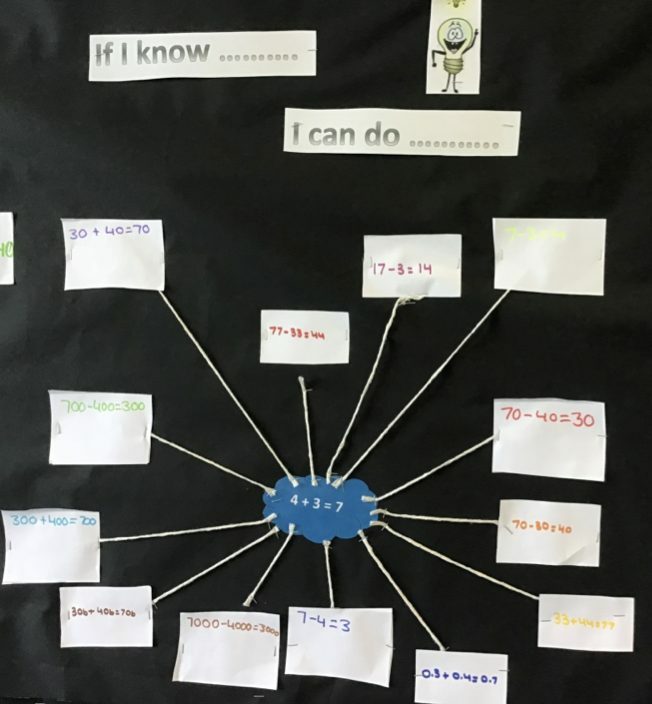 The first key to maths mastery is making connections. I have been doing work on this with 7 set 5. I asked a pupil what 38 – 4 was. The person had to count on their fingers but when I asked them what 8 – 4 was they knew it straight away. The students have so much knowledge but don’t realise it as they struggle to make the connections. Following on from this I have done work with this group on making connections and we have used this to produce some display work. During the recent training on vocabulary that we did made me think about making connections and how this links with if you know the meanings of parts of words then you can work out the meaning of the whole word. Another key factor of mastery is going from the concrete to the pictorial to the abstract. For example with fractions going from physically splitting things into fractions, to then drawing pictures to represent fractions to then solving questions without needing to draw pictures. In secondary school we don’t do a great deal with the concrete, however I am using this more with students who need it. It is not about making everybody start with some counters and then draw etc. It is about students using the part that benefits them. There are plenty who could work out questions without drawing bar models, however, even for the most able students there are times when they would benefit from using them. I will be continuing to work with primary schools to look at how they are teaching mastery in mathematics and am excited to making part of my standard teaching practice.